she share recipes? It looks so beautiful. As do your squash plants! No squash borers here, no sirree Bob! As for dahlias – this is my first year trying to grow them, and they are in pots, only surviving. Yes – the dessert was very delicious. As for recipes, it’s very easy. The cups are actually made from phyllo – Tina bought them pre-made but you could probably do it yourself if you wanted to. Phyllo is not super difficult to work with although I’ve never tried to use it in that small of pieces. If you look at the picture closely, you’ll see that there are actually two different fillings. The white filling is plain yogurt, which sounds too tart but was actually very refreshing on a hot day and my favorite of the two. The yellow filling is just a custard which I think she made from a box. So substitute your favorite vanilla custard recipe or box. 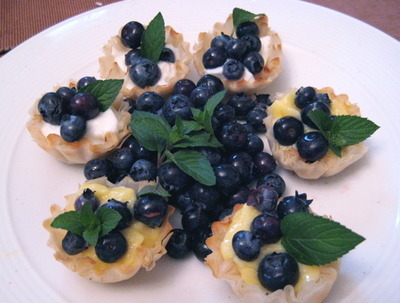 Then she topped it with blueberries from the farmer’s market, which tasted surprising like wild AK blueberries, and chocolate mint from our front porch. Easy and delish! Thanks for the dahlia info – I will search the internet as well. Is it begonias that I remember you wintering over? As for the Joanne’s fabric, I do have a bit of a plan which cannot be disclosed at this time. But it will be cute, I promise. And I must also confess to a little bit of fabric hoarding myself. I really didn’t need to buy 1/2 yards of thirteen different patterns. But it’s so hard to stop! This entry was posted in baking, gardening, sewing. Bookmark the permalink.